Décor + Design is established as Australia’s No. 1 interiors event! Bringing together interior designers, decorators, retailers, architects and manufacturers at the Melbourne Exhibition Centre. Last year’s event attracted over 11,500 trade personnel over the four-day event, in search of the latest interior products and furnishings from over 300 of Australia’s leading brands. 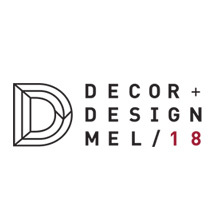 Now in its 15th year, Décor + Design aims to inspire visitors, source the latest products, stay up to date on the trends and developments in the industry and network with peers. Decor + Design is co-located with Australia’s largest Furniture tradeshow, Australian International Furniture Fair. It is a FREE trade only event. Design Laneway & Wall Street, showcasing independent studios designing lighting, homewares, furnishings, textiles and surface art.